I got this photo yesterday and it brought a wave of emotions and memories. This is the first icon that I made in glass. This is the one that got it all started. I carried this image in my mind for years. It’s a very strong icon, strength being a spiritual quality primarily, and aesthetic one when it come to icons. I remember being taken over by something larger than life itself from the very start. The only way to describe the creative process that was happening is to call it mystical: time expanded and stopped, eternity took over, glass seamlessly flowed into place, all the while I existed in a state of profound peace. When it was done, my husband and other practical voices around me strongly advised me to put a price tag on it and put it out on the market. Instead, again in that same state of peace and quiet, I brought it to a friend’s house-a friend who happened to be an Augustinian priest. His house was filled with monks and nuns that day, something was celebrated when they looked at it, their faces changed and there was quiet in the room. My husband knew what I had known from the start-this was not for sale, neither was is for keeps. The icon now is the sole image in the office of that priest, who is now the Head of the Augustinian Order of the Eastern Hemisphere, in Villanova, PA. Everyone walking into his office sees it. He told me, ” I sit them in front of it, and leave them for a few minutes alone, and half of their problems go away. ” Those that do not, acquire a different taste, a different perspective. I sometimes get asked, why did I let that one, the first one go, without even taking a picture? Well, not taking a picture was silly, I agree but letting it go was not. It was an act of reciprocity, what I received – I shared. And in giving it away- I came alive, and continued on creating, or as iconographers say — co-creating. The icons travel. Sometimes, when there is a place for an icon out there, and in a strange mystical way, spirit (what they call inspiration in the art world) finds an iconographer somewhere and besieges him to create. And create he does, not knowing where the icon will go, not knowing why. But trusting, trusting fully, listening, following on the subtlest of hints, and then letting go. After a long period of contemplation I am returning to the iconography. Every time I finish a piece (an icon), I think it is my last- I talk of quitting, I go into months-long withdrawal and recharging period. Then I emerge, incredulous, disbelieving, to face a new piece. The new icon – Annunciation- has been chosen. It is completed, whole, radiant, on a level just beyond the human eyesight. Now comes the ‘fun’ part- I have to put it into physical reality, piece by piece, shard by shard, prayer by prayer. Yet after taking such a long break I forgot about all the ‘non-fun’ little things that accompany any project. Suddenly, I feel like I fell out of the contemplation cloud to face the harsh reality of little decisions that just seem too hard. This is where my recent ‘artwork as a baby’ approach seems to come handy. 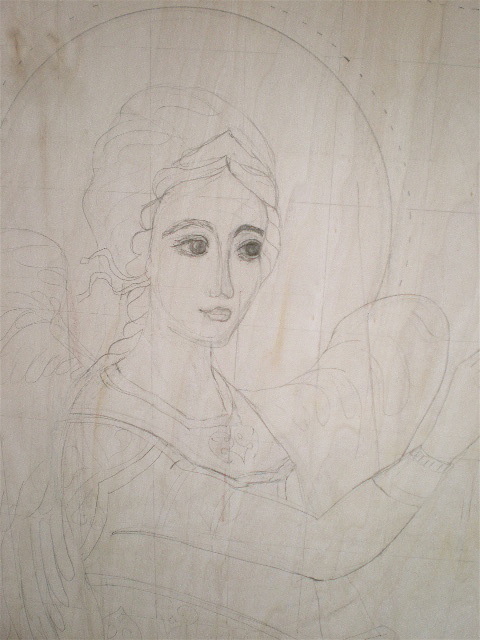 The last icon I worked on, Archangels, I took photos throughout the various stages of the work. It was like taking pictures of an ever changing baby, you know, the first year they seem to change daily. (Granted, Archangels took me almost a year to complete.) And even though we seem to take fewer photos as kids grow older, the pictures become a real treasure some 10-15 years later! All those photos now serve as a reminder of what the piece (and I) went through, all the ups and downs, decision making. It’s helpful, when in the midst of a new piece, to be reminded that it is a process, and it is about the process. Won’t you say the same is true about life? I want to open this by assuring you that it eventually leads into my art and current work, but begins with an important lesson learned on my journey in another business. I used to own a successful body, mind and spirit focused bookstore and gift shop. In addition to the retail store overflowing with herbs, teas, books, jewelry, candles, gemstones, music, soaps, lotions and trinkets of all kinds, we also had a healing center with massage therapists and we offered classes and hosted lots of community events. I had a fairly loose business plan (by most people’s standards) and even so, things seemed to fall into place. It was just the right time and it didn’t take long before the rather new-age shop became “the place to be” even in our fairly conservative area. When a couple of other shops similar in nature began to spring up around us, many of my customers expressed concern. “What are you going to do to stay ahead of the competition?” they’d ask. Or, “Are you afraid they’re going to take your customers?”. While I understood their concerns on some level, on another level I found the whole thing puzzling. I’d never even viewed other stores as competition and in all honesty, as naive as it may seem, I viewed us all as part of the same team and thought there were enough customers for everyone. The idea that someone could “take” customers seemed foreign to me because I guess I never thought of them as mine and only mine anyway. I had a hard time explaining why I wasn’t concerned, so he began to lecture me about how assessing competition is “just plain good business smarts“. It was then that I realized that he was a real jerk…HA! Just kidding! No really, I understood his concern and later thanked him because that afternoon he forced me to pull together my thoughts on the subject and clarify them for myself right there, in the middle of the shop. He was a long-term customer who wasn’t trying to offend me and it helped me understand in less than ten minutes that I did have business smarts, but that mine were intuitive rather than clearly formulated. I explained that being competitive within a market and competing for customers are two different things. I didn’t view other stores as competition or enemies because to expend energy on that pulled attention away from my own shop. However, I was also aware that to remain competitive in the market of rose quartz massage wands, for example, it would also (with only a few exceptions) be unwise for me to drop my price to match another shop’s price. I’d already set a fair one based on a good understanding of how much the wand cost, not just in terms of what I paid for it, but in terms of what it cost to have an employee nearby and ready to explain to a customer how it could be used or to gift wrap it. If I dropped the price, I’d have to make up for it somewhere else by raising the price on another item or by lowering my expectations of the level of customer service we could provide. Unless you’re a Wal-Mart price checker, this kind of managing takes time, wastes energy and usually fails to pay off in the long run. However, if I made sure customers were aware that the wands came prettily wrapped at no added charge and set out a few wrapped examples next to the display along with little cards explaining how they were made and what country the rose quartz came from, I was being competitive in the market by offering knowledge, service and convenience along with their purchase. Believe me, free gift wrap goes a long way with men around the holidays! And, if I had an item that sold for less somewhere else and I couldn’t afford sell it for less or with an extra service, then a competitive business decision would be to sell out the item and not offer it again. I liked making room for new and unique things anyway. I also stayed competitive by considering every person who called the shop a customer even if we didn’t have what they were looking for and the “competition” did. If someone called looking for a book and we didn’t have it in stock or coming soon in an order, my employees and I referred them to any place in town that might. We weren’t vague and we were very clear about making sure they knew it was important to us that they find what they needed. I can’t tell you how this helped my store to remain competitive. It was a real strategy and it worked. We gained customers because of our helpfulness on the phone and if a customer walked in looking for something we didn’t carry (or were out of) they waited appreciativly while we called around town to help them find it. Other businesses who viewed my shop as “the competition” weren’t so helpful and can you imagine how it looked in contrast to our generosity about such things? I explained that while much of my business philosophy was spiritual and heart centered, that there was strategy. It was a strategic decision to educate current customers on the inventory of other shops; it helped them and made us look good. We may have lost a sale on the day of the call, but more often than not we were remembered for our helpfulness and they paid us a visit later. My rather pushy male customer was beginning to understand, but he said something about how if a customer called and we sent them somewhere else, we might never get them into the store and wasn’t that a loss in the long run? I told him that I never once worried about this. That if they went into a store that we sent them to, (usually calling in advance so the seller could have the item ready) the customer would almost always mention that we’d referred them and the other shop owner would take a moment to comment on how nice it was that we sent them over and how lovely our shop was and how supportive I was of other businesses. That in itself is a great endorsement and happened because we took the time to make sure they learned of the shop that had what they needed on a particular day. In one case, an owner, speaking from her own fear of “competition” took the opportunity to take a swipe at our shop and said something negative about me and how “irresponsible” it was for us to be out of a particular book and that she’d “never let such an important volume be out of stock.” The customer, who we had sent to her and who before that day had never heard of her shop or mine, put the book down and walked out. She called us, told us that she’d wait a week for our order to come in and that she’d been shocked by the other shopkeeper’s comment. We were surprised, but said nothing negative in response, only that we were happy she’d found us in the phone book that day, we were sorry it didn’t go well at the other store and we’d call her when her book came in. She told many friends this story and while it was an unfortunate loss for the other shop, it was a gain for us and if the other shop owner had not allowed herself to get caught up in fear, she could have made a sale, gained a new customer and prevented bad word of mouth. Being helpful and positive enabled me to stay above the stress of daily worries about other businesses and helped me to focus on what we offered and the environment I wanted to create. Eventually, when the shop close by went out of business, our regular customers knew there was no gloating on our end and that we had been as supportive to another business as we could be and stayed true to ourselves in the process. If we hadn’t been generous in spirit to that shop and my customers had sensed this, it would have forever tarnished our image in a business that sold tools for spiritual development. While they might have continued to shop there, the energy wouldn’t have matched our message and they wouldn’t have trusted us on some level. It would have only been a matter of time before a new shop with a more positive energy opened and the customers would have gravitated towards it. Eventually, I needed a change, sold my business and began to focus on a different kind of creativiity. I learned quickly that many things change when the majority of your business is done on the internet, working only with shop owners who carry my work as opposed to the retail buyers or face to face in a booth, but not in a brick and mortar. I struggled earlier this year when I saw there was a woman making her wallets out of paper and vinyl, but differently than I do. I got a little caught up in my prices and even went as far as to comment to a friend (not a customer) that I questioned the quality of her items. For shame! Hadn’t I learned anything about my own views as I had explained them to that customer a few years ago? In reality, I didn’t question her quality…I was insecure about my own work and prices. I think we all understand the sinking feeling we have as artists and crafters when we see something on the market similar to our own. Most of us don’t want to admit to it, but it can be hard not to compare another’s work to what we’re doing, but at the end of the day, we have to remind ourselves that if we start to see fellow artists as “competition” we lose our ability to be competitive. In our work, creativity is key and by keeping our heads in our own businesses, we keep our energy focused and our creative juices flowing. While we do have to be aware of what’s out there and be somewhat aware of what others are charging in whatever category of art we’re pursuing, ultimately this matters less than us realistically determining what we need to price an item at to cover our needs and if it’s higher than someone else’s, we have to be OK with it. We also stand to gain more by encouraging our customers to check our the great work being done by other artists. Recently, I was contacted by a woman who’d retained a PR firm to help her market her gorgeous line of stationary. She contacted me to see if I could partner with her on a project to make little purse sized notebook holders. At first, I was excited because I had planned to make them anyway, but after I thought about it, I realized that I was months away from a good design and that I really wanted to focus on my passport cases first. I was only thinking of taking the project out of fear of missing an opportunity and someone else getting it rather than because I really wanted to take it on. I thought of the other woman making the paper and vinyl wallets and decided to refer the woman offering me the project to her. There are some that would say it is a mistake not to grab every opportunity, but it’s better to let one pass if your heart isn’t in it. There are others who might turn it down, but not give another artist a referral and even with all my lessons learned, I did hesitate, but then remembered that the same principles should apply to my new business as did to my old one. These days, I spread the word about Etsy to anyone who will listen and I know that customers will find other wallets out there, but I also know that as long as I keep my work fresh and my eye on my own business goals that I’ll be OK and that I feel great when I can help a customer find a paper and vinyl wristlet from another seller because I don’t make them yet. It’s so much less stressful to be positive about your own business than it is to worry about the impact of someone else’s. Whew, thanks for reading…it was a long one! 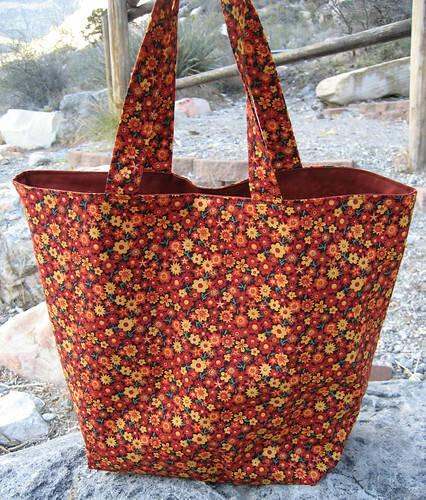 About a decade ago, I borrowed my aunt’s dusty sewing machine and made my first six totes for carrying groceries. The design was simple and the sewing was not very polished, but they went into immediate use. Two were gifts for my mother, and from that time on, she continually asked me to make her more totes. Every few months, I would do just that, using her as my beta tester for every design tweak. Improvements to my design came in sporadic bursts, but three years ago, I reached a point where I was finally satisfied with the constructability and usability of my market totes. My life had changed drastically since I took the first steps towards creating a marketable product, and it seemed like the right time to start collecting fabric and building an inventory. There were a few bumps along the road and some unexpected delays in setting up shop, but I kept sewing. I learned ways to speed up the production and made the process more financially focused than creatively inspired. Now that I have a solid product, I feel like it is time to explore my artistic skills and embellish my standard totes. The fabric available today provides endless possibilities and thanks to that, I don’t see myself tiring of the basic design. I’m currently working on my applique skills and learning to fully use all of the features of my sewing machines. I’m excited about this new stage of evolution. My journey is not very grand compared to that of many artisans, but I feel that it is an excellent path for an at-home mother of four to be traveling. Basing a business on my existing skills and keeping my plans small while dreaming about the future has kept things fairly relaxed. I’m still learning about balance, but that’s another topic for another day! 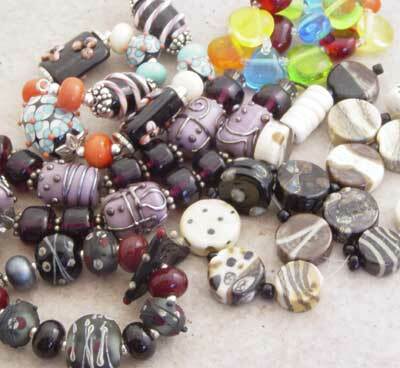 Confession time: I am a bead maker who doesn’t really care all that much about beads or jewelry. Have I shocked you? I know, it’s a horrible thing to say. Did she just say she doesn’t care about beads? Yes, I said it and worse, I wrote it down. 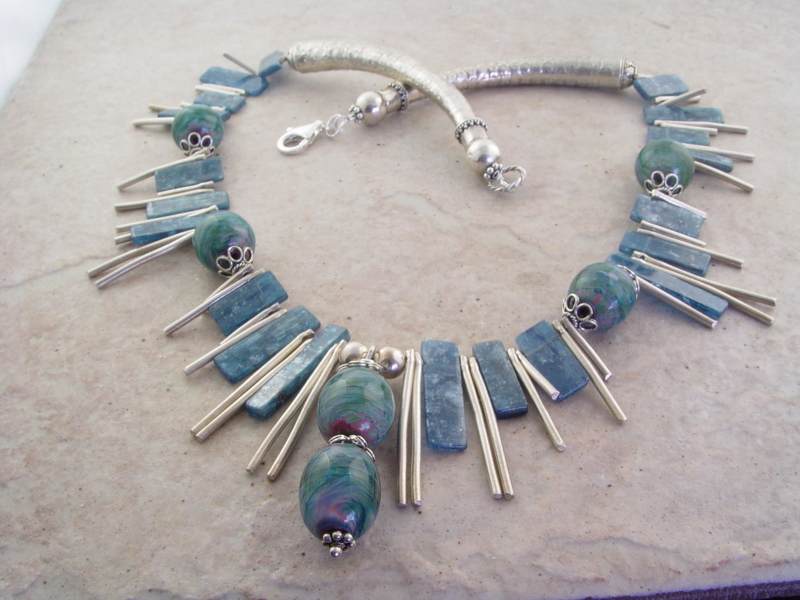 Let me first clarify, I have a great respect and admiration for all the wonderful bead and jewelry artists out there. I am constantly amazed at what each of them continues to create and send out into the world, making people smile and giving us such gorgeous eye candy. The thing is, I just have never had much of an eye for fashion. I am simple in that regard. Dressing up for me these days means clean jeans and a black t-shirt. Seriously. Okay, I have a few skirts, that might count, but I still wear t-shirts with them, though I do refrain from wearing my tevas with the skirts. I just can’t go that far. I almost always forget to put my jewelry on when I leave the house. Just because I said I don’t care all that much about it, doesn’t mean I don’t have some. The stuff I have is treasured as well, but not because I have a great love of jewelry. It is because it was either made by or included beads made by some of my very favorite people. It makes me feel happy to wear it. I also have a few pieces of my own work, made into simple necklaces. The very few I have are special pieces I made and have loved so much, I didn’t want to give them up. So you might be wondering how it is a person who just isn’t all that into beads, ended up making them for a living. Most women I know who are bead makers came at this craft from the jewelry end of the journey. 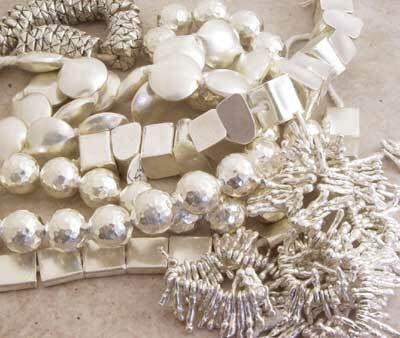 I have heard over and over again from people who say they just loved beads and making jewelry. Then they found glass lampwork beads and were hooked. The journey for them started there. Certainly that isn’t true for everyone, but it is a common story. My journey actually starts with my husband. He saw a lampworker selling her wears at a local art show back in early 2000. Two days later he ordered a torch and a starter supply pack and was up and running within a few weeks. He really wanted to learn to make contemporary marbles, but found starting with beads was easier. Even at that point, I still wasn’t all that into beads. Greg was making sculptural stuff and little mini figurines, all fun stuff, but not anything I ever thought I could do or even wanted to do. 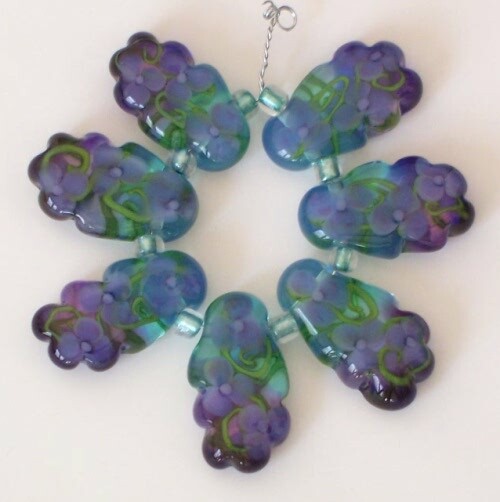 A few years later when we started meeting up with other bead makers, I got to see in person some of those gorgeous little works of art, full of dichroic glass and flowers. Finally I was interested. How do they do that? I asked myself that question more than once. Then I had a few lessons, first from Greg, then Anne Scherm Baldwin, then Kaye Husko. I was fascinated with the process of making beads. I still am. There is something wonderful about sitting down at the torch and blocking out the rest of the world and just creating something, anything. It is all that much better if it comes out pretty and even greater when someone actually wants to buy it! How wonderful. So, it’s true I don’t care about beads in a “I want to surround myself with them and make a bunch of jewelry” kind of way. But I do care about the wonderful little works of art out there and the artists behind them. Sometimes the creative journey seems a lot like air travel today. Not nearly as easy as it was years ago! Lots of missed connections and extra costs. Delays and a few unexpected surprises on the trip. I’ve hit those snags and delays of late so I’m going to take this “journey” more in terms of how I ended up creating jewelry and developing a business out of it. I liked how Lori Anderson handled it in her post awhile back. I’ve always done crafty things. Sewing was my primary love for years and years until my daughter was born. I’ve not sewn creatively since then. The floor was my preferred place to layout and pin patterns…not conducive with an infant/toddler. And somewhere along the lines “they” resized the patterns on me! (OK, it was baby weight that never left, but the thrill of making my own clothes left around that time). 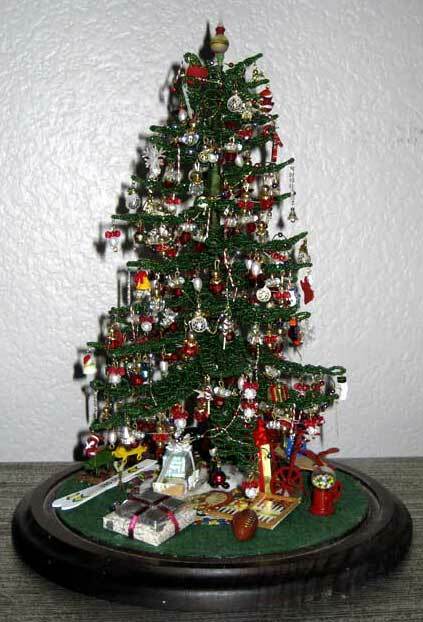 I dabbled in beading years and years ago when I was single with a beaded Christmas tree…made two of them! And then moved on to other things. Have crocheted a bit, fabric painted, and a few other activities through the years. When Emma was 6 or 7 she was invited to a birthday party at a bead store…the girls made little strung necklaces from kits that they chose. She ended up at several and had her own party there one year too. Since the moms stayed closer for those parties, I spent some time poking around the store and occasionally found time to go and sit for a couple hours working on projects for me or as gifts. I learned how to crimp endings and add clasps and the general mechanics of finishing off necklaces and bracelets (as well as an understanding that buying retail was going to get really expensive!). I wasn’t hooked yet. But it was coming. I had discovered Ebay and developed an interest in vintage jewelry that never really went anyway…I’ve got a box of old earrings that have been turned into holiday wreaths and mini-trees for charity over the years. Somehow though in the course of searching, i stumbled on lampwork beads and the obsession was born. I was fascinated with these glass beauties and the detail in them. I bought and bought and developed relationships and friendships with beadmakers all over the world. It was the bonus in the purchase as I had become a bit of a homebody: husband traveled every week, main business was homebased and computer driven, daughter was fairly high maintenance. I didn’t get out much for several years. So my online beadie friends were a godsend. A couple would suggest that I should learn to make my own beads (a couple others thought that was a bad idea! 🙂 ) and as much as I love the beads, I realize that I have no time in my life to become as skilled as my taste in beads would require. But I digress. After collecting beads for a bit, I was making them into jewelry (I actually started with natural stones and crystals and Bali silver but moved on from there to almost exclusively lampwork, freshwater pearls and Hill Tribe silver). In late fall 2001 while we were still reeling from the devastation of 9/11, my husband found out he was losing his job. He stayed on to close down the corporate office (which moved back east) and then tried to find work in the hospitality business for over a year. During that time, I ramped up the book design business and he took over as the “senior editor/delivery boy” enabling me to grow my business enough to keep us afloat on one income for awhile. He started working for one of my clients and eventually ended up working for the large publisher who purchased my client’s business. But it was a long and stressful side trip…I worked endless hours at times and found comfort and sanity by having a bead tray nearby. I could lay out the beads and push them around into various designs even for just 15 minutes late at night. It calmed me. I usually started several projects that way and a week later might get to the point where I could string them. Finishing them off might be another week later in stolen moments. Friends and family wanted to buy what I was making. Somewhere along the way I was introduced to Nirvana (the gemshows in Tucson, not the band!) and Joolz by Lisa was born. I still struggle with finding the time for ongoing creation, not to mention the venue for successful selling and I love to be surrounded by my treasured beads. It’s a topic for another day but my office is a co-mingling of my two lives. To the left of the computer are all things book design. To the right, all things bead and jewelry related. Those who have seen it are a little unsure how I get anything done! When I looked at my given topic this month and saw it labeled as, “The Journey”, I thought of several ways this article could go. I thought, WHICH journey? The journey I take each day when I sit to design? The journey that it takes to find my creative self in the midst of a chaotic day? Or the journey I took to get to this point in my life, where I make pretty things for a living? I’ll start with my first real-world job. It’s as far from jewelry design as it could possibly be — four years in the US Air Force. Joining right from high school, I spent a year in California learning Korean, and then off to Osan AB, Korea, to work an intel position. Lots of fun, except for chemical exercises (see photo for the reason why! ), but no beading. I never even thought of it. A quick jaunt to Italy occured when I realized I was never going to quite be complete without a college degree. I spent the three months before classes started living in Italy, teaching aerobics for spending money. I fell in love with Venice and, of course, Murano glass. I spent my time admiring the vases and large sculptures, never dreaming that glass beads were going to become an integral part of my future career. Oh, if I’d only known then what I know now, and had a bunch of money to spend on beads! Next came college — two years at community college, then finishing off a four-year degree at the University of Virginia, majoring in Biology. I’d taken nearly every microbiology and teeny-tiny-things bio class I could, and was in pre-med, so I’d had lots of time in chem labs. THAT gave me an attention to detail that I use now in each piece I make — it has to be JUST so, down to the ending bit. After self-imposed poverty while getting that degree, I decided to take a year off to make some money before med school, and ended up in the IT world, smack-dab in the middle of the dot.com explosion. Once again, I found myself working in sales and marketing, and gained more skills that would eventually serve me well when I owned my own little company. Now I do about 16 craft shows a year, have tutorials in magazines and a book, have been a mentor to a few new crafters, and have never had a job I loved more. I feel so lucky. All of those twists and turns in my life could have led me anywhere — a career military sergeant, a PeopleSoft IT professional, a doctor, a wedding planner. Each of those stops along the way gave me something to take with me to this part of my Journey. And I couldn’t be happier. You can see Lori’s work at www.lorianderson.net and www.lori2.com.